NEW YORK (CNNfn) - Ever engage in a political sparing match with friends? Or wonder why some civic-minded citizens choose not to vote? Does the idea of representing nonprofit interests on Capitol Hill give you a charge? If so, you might want to turn that passion for public policy into a college degree. Enrollment in political science programs has enjoyed a healthy bump in recent years at colleges across the country, due in part to a growing awareness of the job opportunities available in the field. At least as helpful, however, has been the popularity of new television shows that cast a favorable light on the political and legal professions. "Recent enrollments and degrees earned in political science are going up thanks to the [NBC drama] The West Wing and [ABC's hit legal program] The Practice before that," said Sheilah Mann, director of education and professional development for the American Political Science Association. "We thought we might lose some students because of the presidential impeachment a few years ago, but there seem to be some broader cultural effects that people are paying attention to as well." At present, political science ranks among the most popular of the arts and sciences undergraduate degrees, second only to psychology. And as Dara Levinson, 22, a spring poli sci graduate of the University of California, Berkeley, can attest, the career choices available are no longer just limited to law school. "The reaction of most people is, 'Oh, you're a poli sci major. You're going to be a lawyer,'" she said. "But there are a lot of things out there. It's just a question of what you want to do." Levinson, for example, who is moving from Berkley to New York City in a week, hopes to join one of the many public relations firms that handle policy and campaign planning for political candidates and advocacy groups. "I always said I wish they would offer a class to tell poli sci majors what's out there [in the job market] for them," Levinson said. "You can go into media consulting, campaigning, public relations and branches of law. But there are a lot of other things out there that require poli sci degrees, as well." Visit CNNfn's Career page regularly to read "Working your Degree," a new column that highlights job opportunities for a different college major each week. See the links at the bottom of this page for profiles on the engineering, economics, computer science, physical therapy, history and teaching professions. By definition, political science is the study of government, political systems and public policy, as well the political behavior of individuals and groups. In the workforce, the Bureau of Labor Statistics notes poli sci professionals� conduct research on a wide range of subjects such as relations between the United States and other countries, the political life of nations, the politics of small towns and major cities, or the decisions of the U.S. Supreme Court. More specifically, they might create public opinion surveys, analyze election results, study public documents and interview public officials. 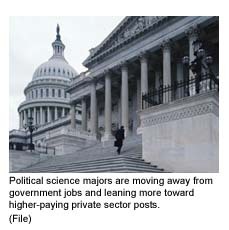 Increasingly, however, Mann said poli sci majors are moving away from� government jobs and leaning more toward higher-paying private-sector posts. "A very important job area for poli sci majors now is in the nonprofit sector," she said. "But the for-profit private sector still remains the largest." Many grads choose to enter campaign management for political candidates, news reporting or lobbying for interest groups, both in the nonprofit and corporate sectors. Still others with a poli sci bachelor's degree teach high school history, government or civics, assuming they complete the state education courses and licensing requirements. "Knowing how to interpret public policy is a skill you need to have for all those jobs," Mann adds. The College Majors Handbook, published by JIST Works, Inc., notes political science grads with a bachelor's degree rarely end up in positions directly related to their field of study. Not surprisingly, many, too, go on to law school, or business school to earn their master's degree. Those who want to teach on the collegiate level must continue on for their Ph.D. The College Majors Handbook reveals that 25 percent all poli sci majors eventually earn a law degree, while another 20 percent go on for their master's degree. "It's a good degree for a variety of careers," said Susan Lawrence, a professor and vice chair for undergraduate studies in the Rutgers political science department. Many colleges and universities have eliminated government from their roster of available degrees and merged those courses into the political science program. Many, too, have begun offering specialized tracks, or concentrations, including pre-law, public administration and international relations. Political science professionals fall into the social sciences category along with historians, economists, anthropologists and sociologists. The BLS notes overall employment of social scientists, not including economists, is expected to grow 10 percent to 20 percent through 2008 - about as fast as the average for all occupations. Prospects are best, it notes, for those with advanced degrees. Grads who enter the job market armed with only a bachelor's degree will have the best luck landing jobs with social service agencies; research and testing services, and management consulting firms. To ensure their marketability post-graduation, the APSA reports many students interested in political science elect a double major in economics, business, English or journalism/communications. If you're considering a degree in political sciences, you may want to obtain a free brochure from the American Political Science Association called "Political Science: An Ideal Liberal Arts Major." You can either call them up or, better yet, send e-mail request to: publications@apsanet.org. (Be sure to include the name of the brochure). There's also H-Net Job Guide, a database of career opportunities specifically for history, humanities and the social sciences, which is updated weekly. According to the Labor Department, the median annual earnings of all social scientists (excluding economists, psychologists and urban planners) were $38,990 in 1998, the most recent year for which data are available. But political science grads actually have a much higher earnings potential. The College Majors Handbook reports college grads with a bachelor's degree in political science earn an average $50,800 per year, about $2,500 more annually than the average person with a bachelor's degree. Those who land in managerial and administrative jobs earn the most, at $68,000 per year, followed by those in the insurance, securities, real estate and business services fields, who earn closer to $61,000 per year, the handbook reports. 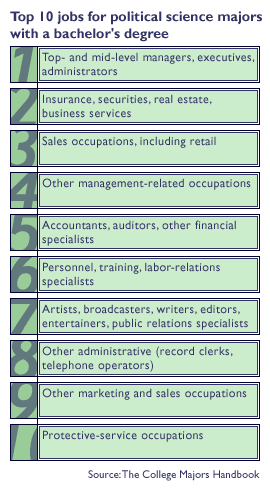 Marketing and sales positions pay roughly $54,000, those in the broad category of artists, broadcasters, writers, editors and public relations specialists earn closer to $52,000 and grads who end up in the protective services earn roughly $53,000. All other occupations that commonly hire political science grads pay in the $40,000 per year range, except for those in the administrative (record clerks, telephone operators) field, who earn roughly $32,000 a year. No matter how you choose to use your degree, Lawrence, of Rutgers University, insists you'll have no trouble if you like what you do. "The job market [for poli sci grads] is stable and strong," she said.� "It's like any major. If you're good at it, you'll get a job. There's always room at the top, so follow your interests and your heart."